The quilt collection of Susan & Laurie Kraftcheck is featured in the 2015 Quilt Exhibit. Photo courtesy of Bonnie Sitter. EXETER –Joseph Hisey began his collection with a complete set of Edwardian women’s underwear. 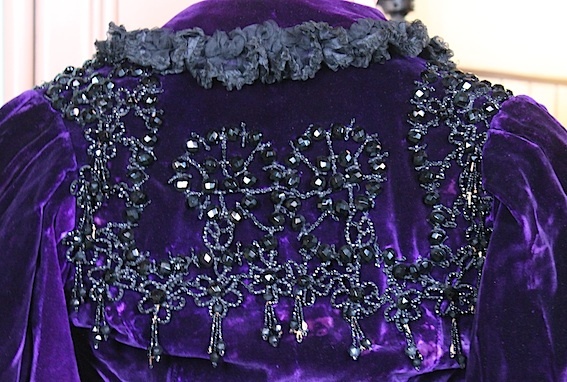 Intricate jet beading adorns the back of this purple silk velvet caplet from 1895.
has grown his collection to include not only nightgowns and petticoats with fine needlepoint, but about 200 pieces that represent developments in women’s fashion from 1849 through to current day. 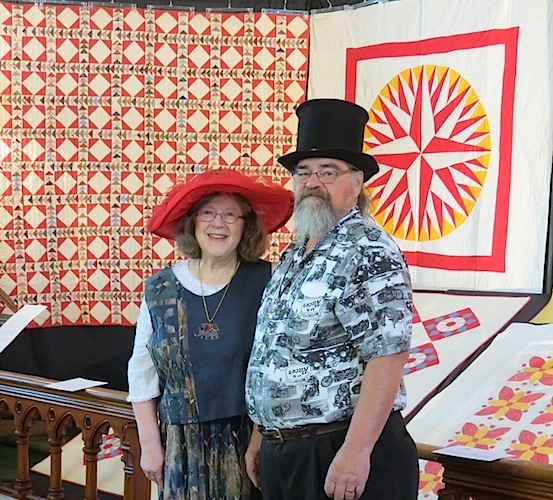 A number from the Victorian era are on display in the 2015 Heritage Quilt Exhibit at Trivitt Memorial Anglican Church in Exeter until Saturday, April 18. 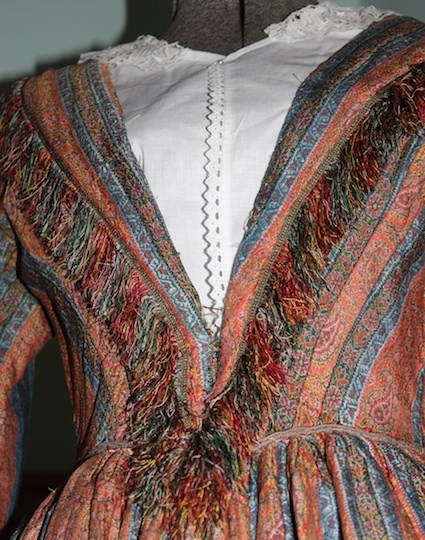 A woollen dress is woven in a stripe design of blue and orange with silk fringe. family of a woman who brought what would have been her best dress from England to Canada. Then there’s the two-piece cream pont d’esprit dinner dress he discovered crumpled in a box at a flea market at Christie’s. Taking a chance, he paid $20 for the small bundle and found the delicate dress was in perfect condition with a label from Toronto’s Wm Stitt & Co. (circa 1900), estimated to be worth as much as $700. Other dresses have come from eBay, flea markets, auctions and donations. 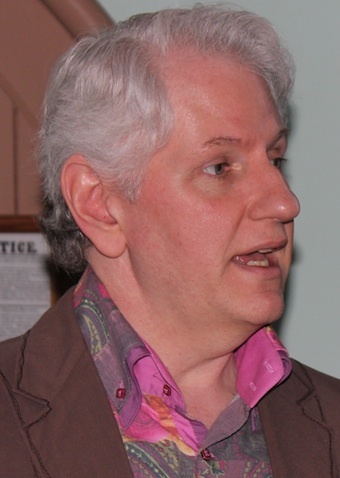 Joseph Hisey, textile and vintage clothing collector and fashion history instructor. “I swore I’d never collect dresses. Coins take up so much less space,” Joseph joked. He keeps about five dresses displayed on mannequins in his home, with the rest carefully wrapped in acid-free paper and boxes and stored away. From time to time, he invites friends to help him air out the dresses and refold them so that they don’t wear along a fold line. In return, he makes an event out of it, providing commentary on the history of the dresses. World War I Red Cross quilt. 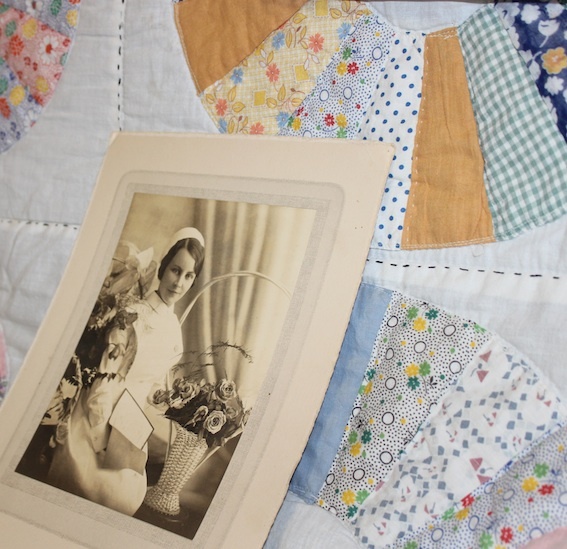 The 95 quilts in the curated show also tell stories of the women who pieced and sewed them together, and of the people who were important in their lives. 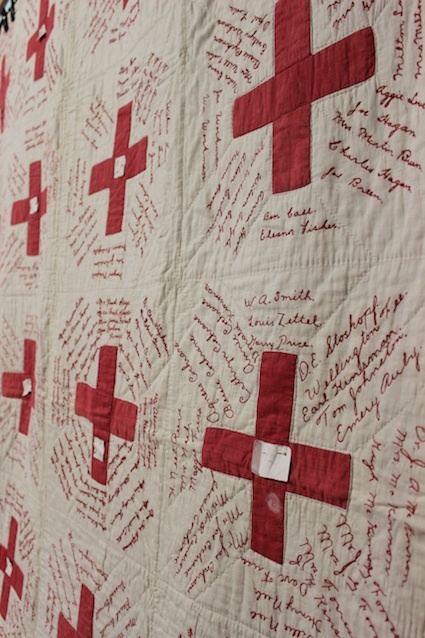 Among the dozens upon dozens of quilts that hang from frames or dowels is one with rows of red crosses and more than 600 embroidered names on a white background, probably created to raise funds for the war efforts. Each cross has a piece of paper with a number pinned to it, which corresponds to numbers in a binder, listing the names associated with that cross. The quilt’s owners, Janis and Peter Bisback, bought it at a Clinton auction in the 1980s and believe it was fund-raising project of the Hillsgreen Church. Grace Manson died of tuberculosis before she finished this quilt. Another quilt of colourful fabrics that mimicked petalled flowers from fine porcelain plates was made by Grace Manson, intended as a wedding quilt. However, she contracted tuberculosis and called off the wedding, dying in 1939. The unfinished quilt was finally completed in the 1980s. The show also features the quilt collection of Laurie and Susan Kraftcheck, of Exeter, and vintage hats of Lynn Wilcox. When: It runs Friday, April 17 from 10 a.m. to 5 p.m. and Saturday, April 18 from 10 a.m. to 4 p.m. Cost: Admission is $6. Lunch is available on site. Funds raised at the quilt exhibit support the Bach Music Festival of Canada, with its 2015 Festival Season running from July 12 to 18. The season was recently announced and tickets are available online. There will also be a brown bag lunch series from Monday through Friday at noon at Trivitt Memorial Anglican Church.